Posted April 7, 2014, in Featured News, News, Student News, We R Arts and Sciences Student Spotlight. Rutgers-Camden students frequently are honored for their outstanding undergraduate research. 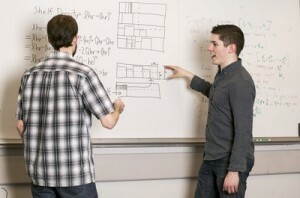 The most recent students to receive recognition are Brian Brubach and Robert MacDavid, senior computer science majors who last year made important discoveries recognized by the Computing Research Association (CRA). Undergraduate research is a cornerstone of the Rutgers-Camden experience; students across campus are able to relate to the challenges and rewards that come with the task. Since Brian and Robert have received their honorable mention for the 2014 CRA Outstanding Undergraduate Research Awards, the research process has become a gateway to internships, summer programs, and classes at other prestigious universities, and assisting Rutgers–Camden’s expert faculty in their own research projects. Computer science majors Brian Brubach and Robert MacDavid will pursue advanced degrees after their May 2014 graduation. Brian Brubach earned his first bachelor’s degree in film and video from Columbia College of Chicago, after which he worked at Chicago’s Center for Community Arts Partnership as a teaching artist and program associate. In his freelance work he focused on cinematography, camera work, and lighting. In 2012, the Maryland native and his wife returned to the east coast when she enrolled at the University of Pennsylvania for her master’s degree. 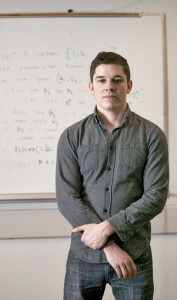 The move prompted Brian to start a two-year program offered by Rutgers–Camden to receive his second bachelor’s degree in computer science. The short distance from his new Philadelphia home to the Camden campus made the process of returning to school a seamless one. 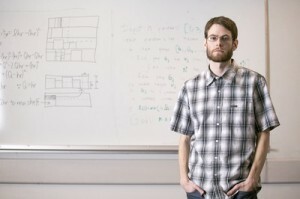 Before enrolling at Rutgers–Camden, he had little familiarity with computer science beyond some programming experience. In his first semester at Rutgers–Camden, Brian took a class in theoretical computer science with Dr. Rajiv Gandhi, Associate Professor of Computer Science, which was “life-changing.” From then on, he knew computer science was what he wanted to do. Dr. Gandhi has remained an important mentor to Brian during the span of his education, providing his time and resources for Brian while he was researching independently. Dr. Gandhi’s teaching had a “huge effect on me,” Brian said. Brian also attended and mentored in summer programs and classes that Dr. Gandhi was teaching at Princeton University and the University of Pennsylvania. The opportunities revealed to Brian an untapped ambition to work as a faculty member like his mentor. Robert MacDavid’s interest in computers led him to the computer science major. Robert MacDavid had a strong interest in computers and math as a student at Collingswood High School. He sought a major that took his curiosities to a higher level of proficiency and a school that was close to home. Rutgers–Camden’s computer science program made itself the obvious choice. Robert took Dr. Gandhi’s Math Foundations course, which is a requirement for computer science majors, and like Brian, found an experienced mentor in his instructor. He also audited graduate-level classes at the University of Pennsylvania which were taught by Dr. Gandhi’s colleague and presented on discrete mathematics, algorithms, and theorems to his Ivy League classmates. In the summer of 2013, he worked as undergraduate research intern for University of Maryland’s Dr. Samir Khuller, studying the Traveling Salesman Problem (TSP). TSP seeks to find the shortest possible tour of all desintations for information to travel given a series of destinations and distances between them. With Robert’s assistance, the research determined cost function ratios and solutions of a provably good cost for a special variant of TSP. The experience led him through a trail of citations, testing his knowledge, and especially his patience. Still, he was uncertain that he would be able to conduct original research in the following fall semester. Dr. Gandhi was extremely helpful in finding a topic with Robert for the project, from where Robert was able to provide his own discoveries and prove their accuracy. Brian Brubach’s degree in computer science will be his second bachelor’s degree. Dr. Gandhi mentored Brian and Robert through their independent research theses. When they look back on the experience, they “can’t stress enough how important he has been” to them. It is a dedicated faculty member who invites his students to his home and works tirelessly into the early morning hours with them, and Dr. Gandhi motivated them beyond their expectations. Robert’s focus came out of a suggestion made by Dr. Gandhi. He designed and analyzed an algorithm for the Generalized Bin Packing problem, which is necessary for many narrower packing problems. Brian focused on Online Square-into-Square Packing and provided the latest improved result to the problem. They submitted their projects to the CRA, which took an incredible amount of time and energy in and of itself. Their competition included students from top schools. The CRA chose two winners, one of whom had already published a paper as an undergraduate. Brian and Robert received honorable mentions along with twenty-two other distinguished undergraduate researchers. The awards are important to their careers, but are also a source of pride for Rutgers–Camden as a community of research-driven students and faculty. Brian and Robert believe instructors like Dr. Gandhi could motivate future students to make worthwhile discoveries at Rutgers-Camden. They both plan to continue their studies in computer science and encourage students to seek connections with instructors who give their time and knowledge to students generously. Page last updated by Faculty of Arts and Sciences at 2:27 pm July 22, 2014 . This page was printed from http://fas.camden.rutgers.edu/2014/04/07/we-r-arts-and-sciences-brian-brubach-and-robert-macdavid/ at 9:23 AM Friday, April 26, 2019.